This post is sponsored by Auldey Toys. Whether it be a short drive to your friend’s house for hot cocoa, a bus trip home on the last day of school before winter break, or a plane trip to the other side of the world to be with your family, travel is an essential part of the holiday season. It’s the time for family, friends and, of course, fun. Auldey Toys understands the importance of travel and how it connects us all, and they want to hear your stories! They’re holding a holiday travel sweepstakes through December 8, and they asked us to pass the message along to you. Head to their Facebook page, and let them know where you’d like to travel to this year. You’ll be entered into their sweepstakes with the chance to win a Super Wings™ prize pack including a $100 travel voucher! 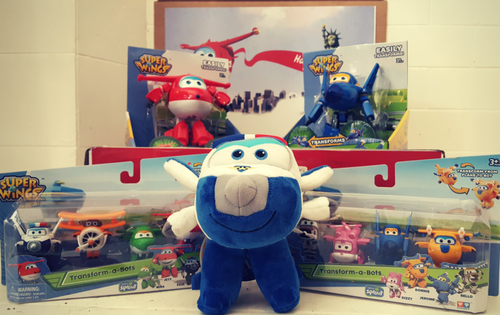 Super Wings follows a red plane named Jett whose mission is to deliver packages to children around the world, helping them solve problems creatively and teaching them a bit about different cultures and countries. This year, they’re helping Jett deliver some holiday cheer and make this season even sweeter! Make sure you enter today, because the sweepstakes ends tomorrow! That’s Thursday, December 8, 2016! This is a sponsored post. Poshbrood has partnered with Auldey Toys to promote this sweepstakes. We do not have any say over the prize, judging or winners of this contest. All thoughts and opinions expressed on Poshbrood and Posh Blog are our own.